As Neil settles into her new house in Albuquerque’s North Valley, she befriends thirteen-year-old Cheyanne Morales, who lives in a nearby trailer with her mother and her younger half-brother. Cheyanne’s teenage angst is complicated by the pressures that gang culture imposes on her and her peers. Neil gets a harrowing glimpse of these pressures when a fifteen-year-old is shot to death not far from Neil’s new home. The cops suspect a rival gang member, but late one night, a battered Cheyanne shows up at Neil’s front door to confess that she was the shooter. The authorities are reluctant to accept Cheyanne’s story—as a minor she’d get only a slap on the wrist—and Neil is dubious too, but she agrees to represent her young friend. With Cheyanne in custody, Neil uncovers chilling evidence that the girl’s family and friends intend to take justice into their own hands. Only Neil and her lover, the Kid, can prevent another tragedy from playing out along the ditches of her new neighborhood. 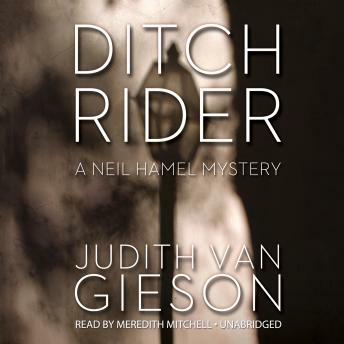 With its intricate, timely plot, deft characterizations, and artful evocations of place, Ditch Rider confirms Judith Van Gieson’s reputation as one of the foremost writers of Southwestern suspense.